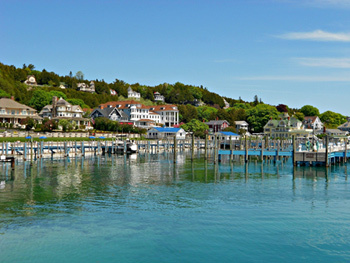 Mackinaw Island: Mackinaw Island is a very popular tourist destination, and offers a wide variety of fishing opportunities. We are happy to design custom charter packages that include customer drop-off or pick-up on Mackinaw Island. Mackinaw Island features dramatic underwater structure, and we often fish in front of scenic Arch Rock and the historic Grand Hotel. The deep water shipping channel directly under the Mackinaw Bridge is often an excellent place to find bait fish and active King Salmon, and is another favorite fishing spot for the Diabolical. 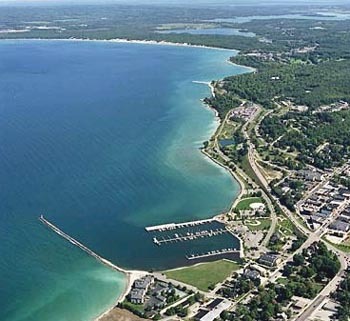 Petoskey/Bay Harbor: Little Traverse Bay, featuring the ports of Petoskey, Bay Harbor, and Harbor Springs, holds good numbers of adult King Salmon during the month of September. Fish stage in Little Traverse Bay in preparation for making a run up Petoskey’s Bear River, and September is prime time for targeting big King Salmon from Bay Harbor to Petoskey. Diabolical Sportfishing offers charters out of Petoskey, targeting large King Salmon during the month of September and early October. Mackinaw City: Mackinaw City offers excellent fishing opportunities from mid to late summer. Atlantic Salmon, King Salmon, Steelhead, and Lake Trout are commonly found near the Mackinaw Bridge, Mackinaw Island, and underwater structure near Mackinaw City. Arrangements can be made for clients to be dropped off on Mackinaw Island after fishing, and Mackinaw City features an excellent fish market to smoke and/or freeze fish for customers traveling home. 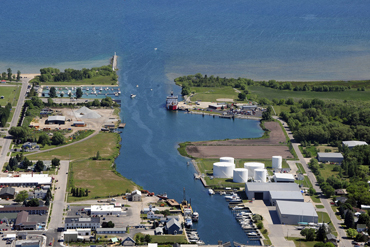 Cheboygan: The port of Cheboygan features numerous offshore reefs holding a variety of fish species. King salmon, Atlantic salmon, Steelhead, Lake Trout, and Coho Salmon can be caught from May through September. Bois Blanc Island and Spectacle Reef feature incredible scenery and underwater structure, and are well within range of the Diabolical. 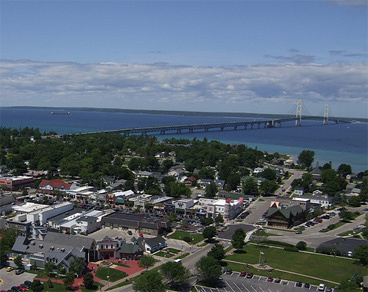 Cheboygan is approximately 15 miles East of the Mackinaw Bridge and Mackinaw Island, making trips to Mackinaw Island feasible from the Cheboygan River. We can make arrangements to have your fish smoked and/or vacuum sealed and frozen by a local fish market.